NZ A1GP race car, Black Beauty and NZ's SimDeck Formula Sim car prepare to add some high speed attraction at Browns Bay. 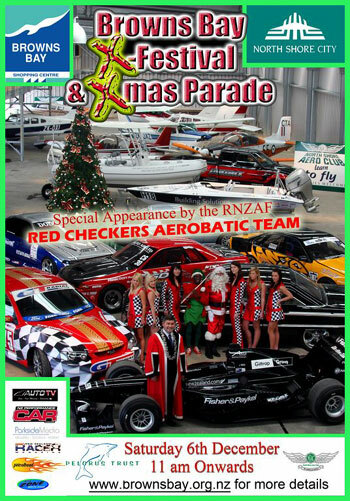 SimDeck Formula Simulators, A1GP NZ race car, Father Christmas, local Fire Brigade, Churches, Community Groups, local companies, all gathered together to entertain the crowds for the 2008 Christmas Parade. Having a Christmas Parade is one guarranteed way of entertaining the families and filling the streets. The weather was perfect, the Red Chequers flew their stunts overhead, the power boats were out racing, RNZAF had one of their choppers “surfing above the waves” out over the beach, families crowded in for picnics, Christmas shopping, skate boarders did their hoops and numerous crashes occured on the SimDeck Formula simulators. The weekend parade was an important one for the community to celebrate, in what must be one of the most stunning family spots in the world to celebrate Christmas, life and to enjoy friends and family. Many families took advantage to spend quality time together throughout the afternoon and to enjoy some racing, picnics and the entertainment that filled the park. Browns Bay shopping district was packed to capacity on a beautiful summer day. Everyone was eager to catch all the floats. After the parade the SimDeck Formula Simulator was setup where folk could do some high speed racing around the Spa circuit. The Browns Bay Business group put together an excellent event. Congratulations. Commisserations to all the Honda F1 team …anyone got a cool $599,999 to spare to help me buy the team. I have $1 and a simulator so that should reduce on road costs given that each Km travelled the car travels costs about $US1500 …ouch. As Bernie Ecclestone suggested all the F1 tech guys should go and play on their Playstations … see Real world racing is going to turn to simulation and the Green parties worldwide will rejoice.